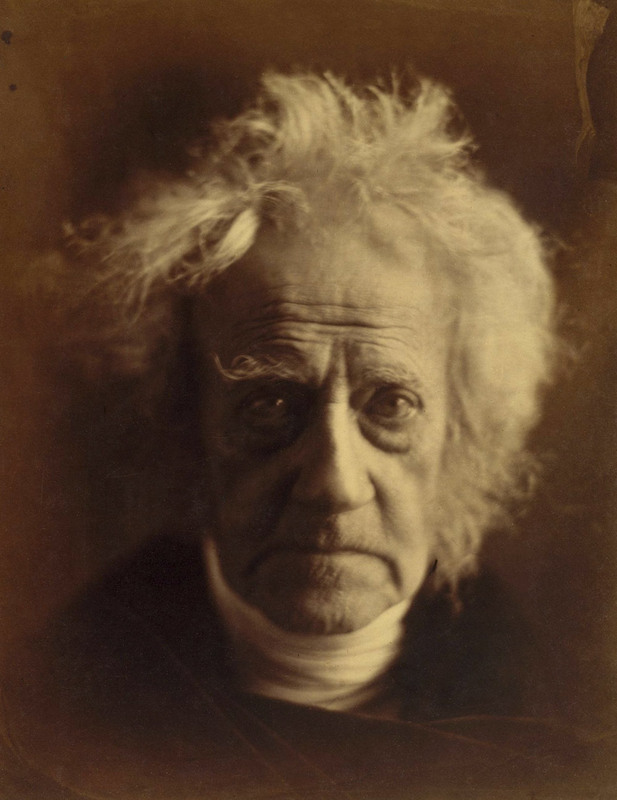 The portrait of Sir John Herschel (April 1867, below) is one of the most famous portraits in the history of photography. What a magnificent achievement, to capture the spirit of this human being on a glass plate… “Our Julia” as a friend of mine lovingly calls her. It’s funny how everyone takes her to their heart. Many thankx to the The Metropolitan Museum of Art for allowing me to publish the photographs in the posting. Please click on the photographs for a larger version of the image. Mary Hillier, a beautiful young house servant at Dimbola, Cameron’s home in Freshwater, was often pressed into photographic service, frequently in the role of the Virgin Mary. She managed to assume her various guises in a remarkably unselfconscious way, projecting both gentleness and strength of character. Hillier is also the model for Cameron’s Sappho, a profile portrait in the Florentine Quattrocento style, perhaps inspired by the chromolithographic reproductions of Italian paintings distributed by the Arundel Society, of which Cameron was a member. The image has great presence, so much so that Cameron decided to print it even though she broke the negative. Precisely what the picture has to do with the Greek poet of Lesbos is unclear, especially since Cameron inscribed another print of the same image Adriana. 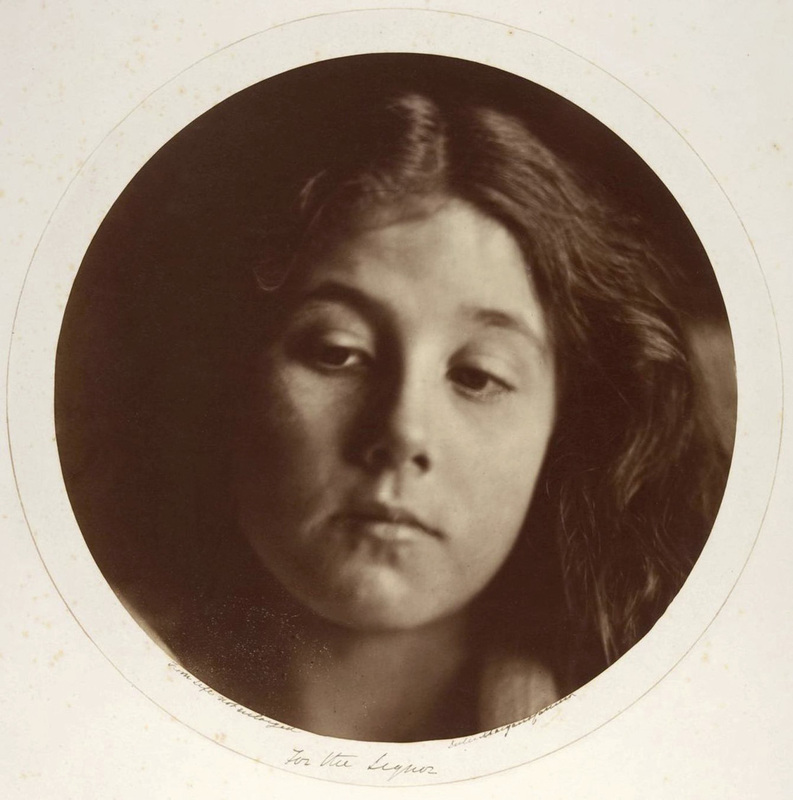 The titles of two close variants reveal that, by looking left instead of right, Hillier was apparently transformed from Sappho into Dora or, when photographed from one step further back, Clio. 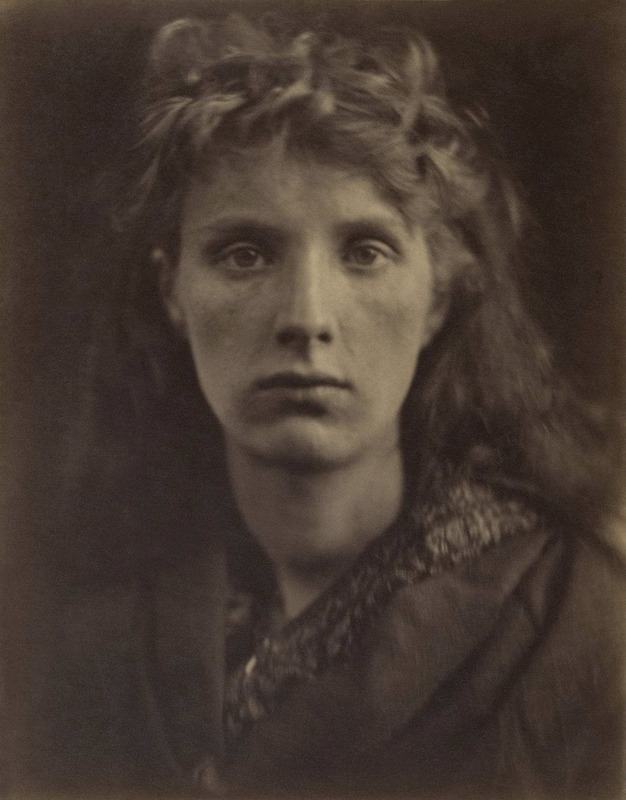 Although Cameron often set out to portray a certain ideal, she also titled pictures after the fact, sometimes because the image seemed to embody the character of a certain literary or biblical figure, but sometimes, one suspects, quite simply because there was more of a market for images of the Virgin, Sappho, or Christabel than for portraits of the photographer’s niece or a parlor maid from the Isle of Wight. The mountain nymph, sweet Liberty. Cameron sent the photograph to her friend, the renowned scientist Sir John Herschel, who wrote back, “That head of the ‘Mountain Nymph Sweet liberty’ (a little farouche & égarée [timid and distraught] by the way, as if first let loose & half afraid that it was too good to last) is really a most astonishing piece of high relief. She is absolutely alive and thrusting out her head from the paper into the air. This is your own special style.” Herschel seized upon the photograph’s most striking quality, its startling sense of presence and of psychological connection with the viewer. This portrait of Julia Jackson, which is usually trimmed to an oval, suggests an antique cameo carved in deep relief. Its success lies partly in its subject’s actual beauty and partly in the way the photographer modeled it to suggest Christian and classical ideals of purity, strength, and grace. The photograph was made the year Julia married Herbert Duckworth. Three years later she was a widow and the mother of three children. 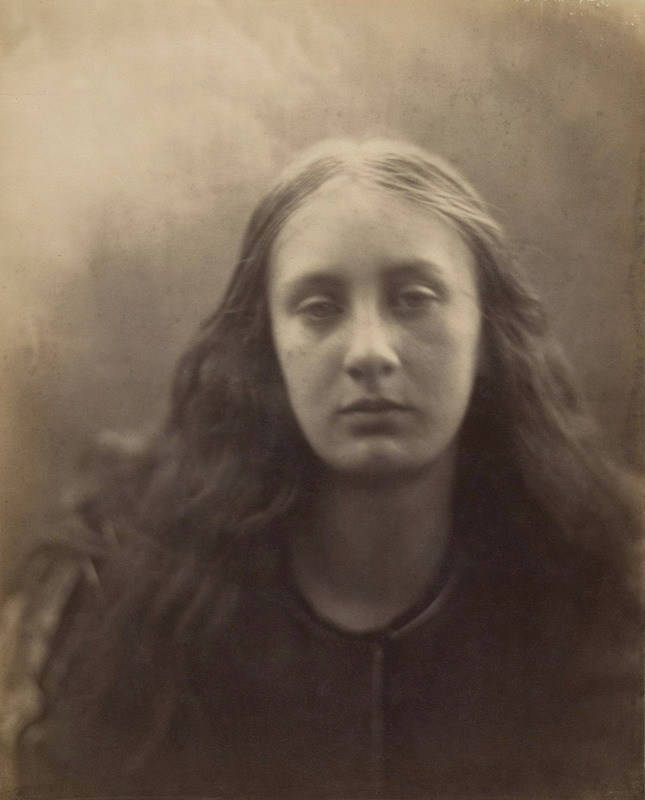 Alice Liddell (1852-1934) – who, as a child, was Lewis Carroll’s muse and frequent photographic model – posed for Cameron a dozen times in August and September 1872. 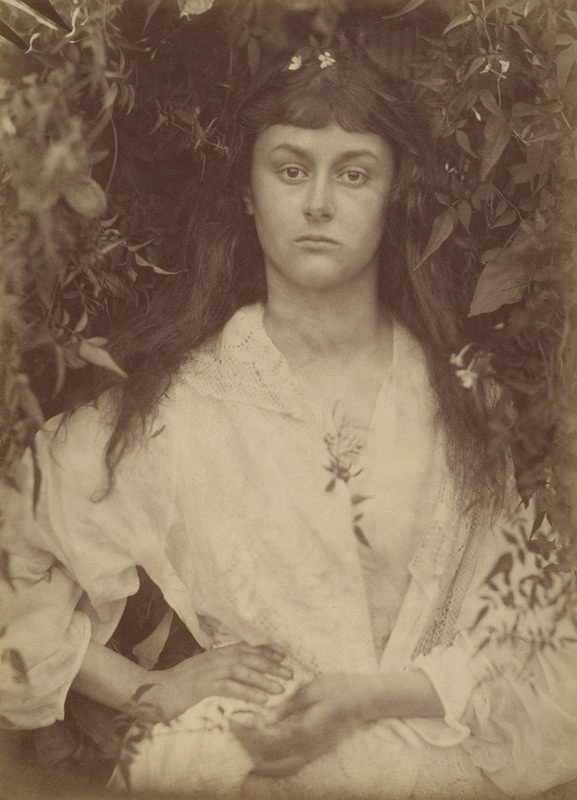 Against a dense background of foliage and bedecked with flowers, the twenty-year-old Liddell was photographed by Cameron as the embodiment of fruitful abundance, Pomona, Roman goddess of gardens and fruit trees. 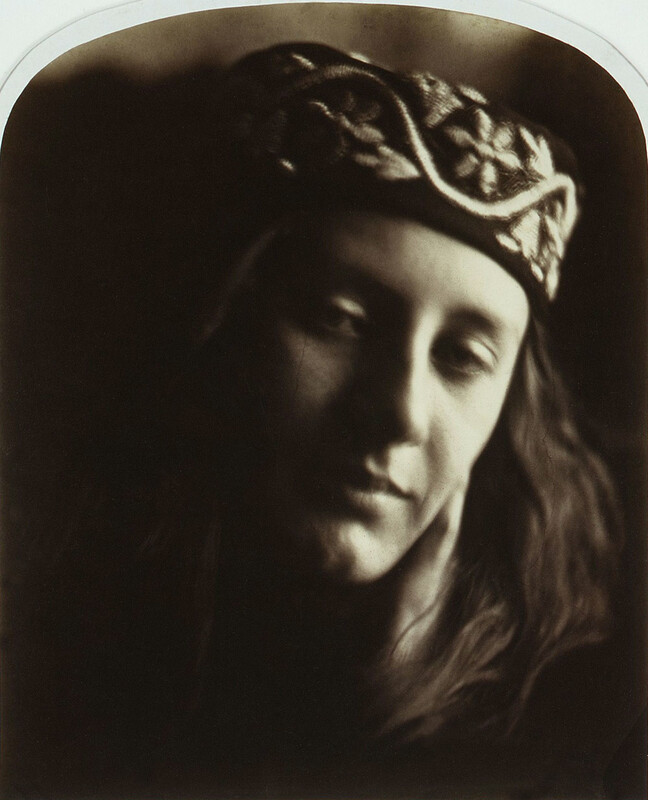 “One of the greatest portraitists in the history of photography, Julia Margaret Cameron (1815-1879) blended an unorthodox technique, a deeply spiritual sensibility, and a Pre-Raphaelite-inflected aesthetic to create a gallery of vivid portraits and a mirror of the Victorian soul. 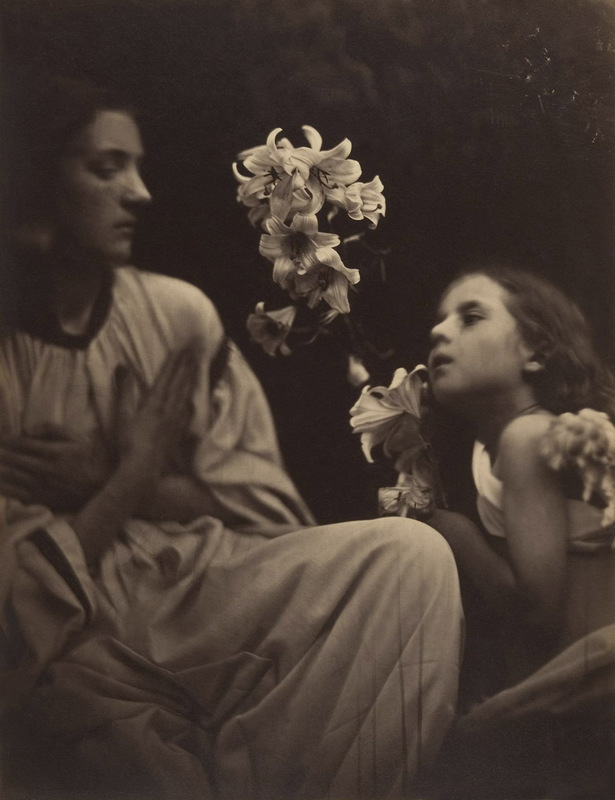 Julia Margaret Cameron, on view at The Metropolitan Museum of Art beginning August 19, 2013, is the first New York City museum exhibition devoted to Cameron’s work in nearly a generation and the first ever at the Met. The showing of 35 works is drawn entirely from the Metropolitan’s rich collection, including major works from the Rubel Collection acquired in 1997 and the Gilman Collection acquired in 2005. The exhibition is made possible by The Hite Foundation, in memory of Sybil Hite. 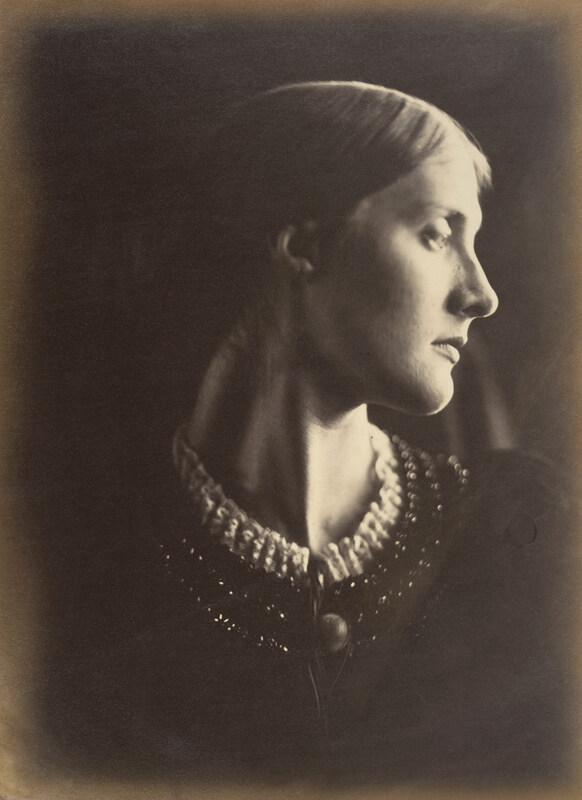 When she received her first camera in December 1863 as a Christmas gift from her daughter and son-in-law, Cameron was 48, a mother of six, and a deeply religious, well-read, somewhat eccentric friend of many notable Victorian artists, poets, and thinkers. “From the first moment I handled my lens with a tender ardour,” she wrote, “and it has become to me as a living thing, with voice and memory and creative vigour.” Condemned by some contemporaries for sloppy craftsmanship, she purposely avoided the perfect resolution and minute detail that glass negatives permitted, opting instead for carefully directed light, soft focus, and long exposures that allowed the sitters’ slight movement to register in her pictures, instilling them with a sense of breath and life. 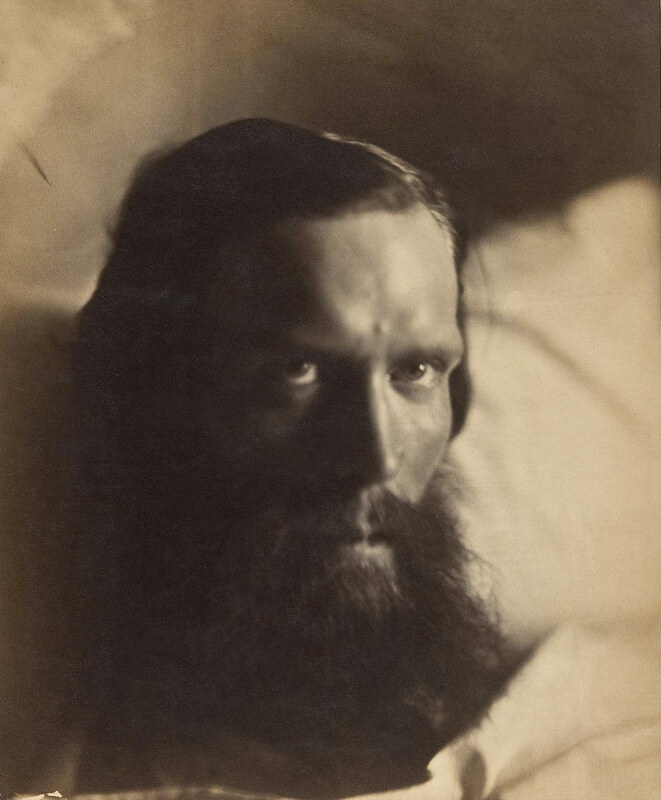 On February 21, 1866, Cameron wrote to Henry Cole, director of the South Kensington Museum, “I have been for 8 weeks nursing poor Philip Worsley on his dying bed… The heart of man cannot conceive a sight more pitiful than the outward evidence of the breaking up of his whole being.” An Oxford-educated poet who translated the Odyssey and part of the Iliad into Spenserian verse, Worsley died of tuberculosis at the age of thirty the following May. Cameron’s portrait, made the year of his death, vividly conveys the intensity of Worsley’s intellectual life and something of its tragedy. To her subject’s hypnotic gravity she added intimations of sacrifice, engulfing the dying poet in dramatic darkness. 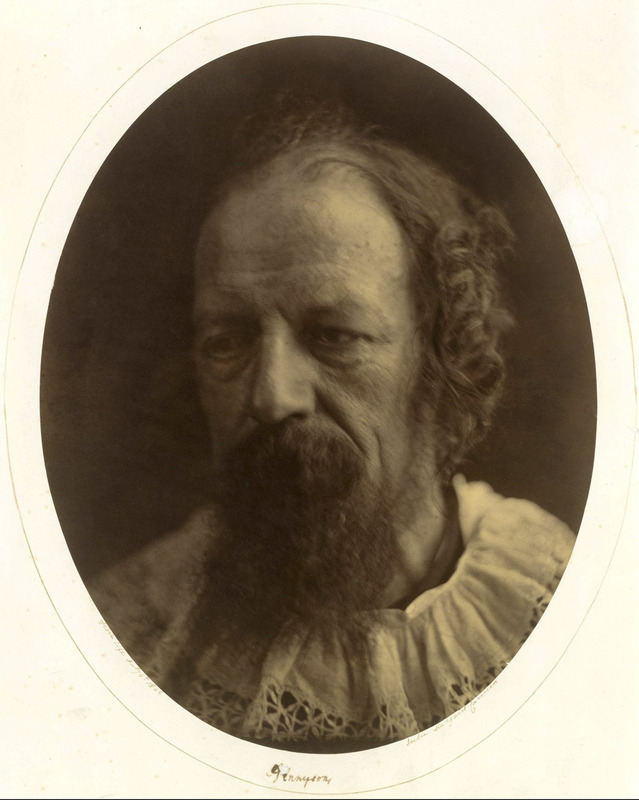 When Cameron’s husband retired in 1848 from the Calcutta Council of Education and the Supreme Council of India, they moved to England, settling first in Tunbridge Wells, near Charles’s old friend the poet Henry Taylor, and later in Putney Heath, near the poet laureate Alfred, Lord Tennyson and his wife. For Cameron, these men were not merely friends and neighbors, but also intellectual, spiritual, and artistic advisors. In 1860, while her husband was in Ceylon checking on the family coffee plantations, Cameron visited the Tennysons’ new home at Freshwater on the Isle of Wight and promptly purchased two cottages next door, which she joined together as the new family home. Cameron’s friendship and determination knew no bounds – indeed, her kindness could be overbearing at times. It took three years of pleading before Cameron convinced Tennyson (who jokingly referred to her models as “victims”) to sit for his portrait. No commercial portrait photographer of the period would have portrayed Herschel as Cameron did here, devoid of classical columns, weighty tomes, scientific attributes, and academic poses – the standard vehicles for conveying the high stature and classical learning that one’s sitter possessed (or pretended to possess). To Cameron, Herschel was more than a renowned scientist; he was “as a Teacher and High Priest,” an “illustrious and revered as well as beloved friend” whom she had known for thirty years. Naturally, her image of him would not be a stiff, formal effigy. Instead, she had him wash and tousle his hair to catch the light, draped him in black, brought her camera close to his face, and photographed him emerging from the darkness like a vision of an Old Testament prophet. This image, also titled After Perugino / The Annunciation, is one of more than 130 religiously themed images inspired by Cameron’s deep Christian devotion and her artistic admiration of Italian painting of the early Renaissance. 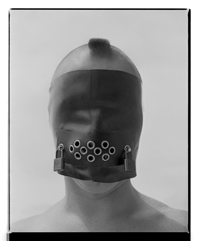 Such photographs adhere to traditional iconography only in the broadest sense. Here, for example, Cameron follows the precedent of paintings of the Annunciation in which the angel Gabriel presents a lily – symbol of purity – to the Virgin Mary. More important, however, Cameron’s sincerity of sentiment imbues her work with an aura of devotion and claims for it a place equal to sacred art of the past. 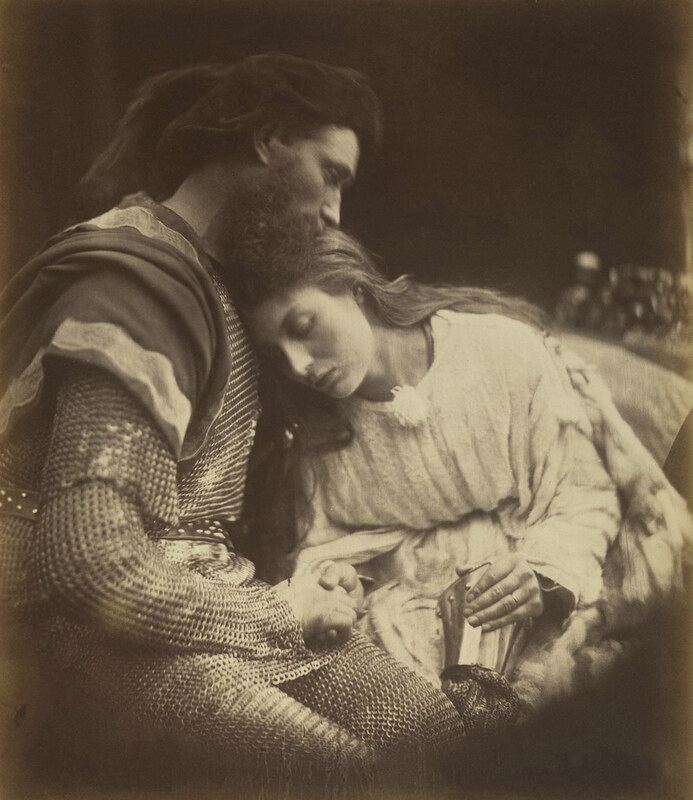 In 1874 Tennyson asked Cameron to make photographic illustrations for a new edition of his Idylls of the Kings, a recasting of the Arthurian legends. Responding that both knew that “it is immortality to me to be bound up with you,” Cameron willingly accepted the assignment. Costuming family and friends, she made some 245 exposures to arrive at the handful she wanted for the book. 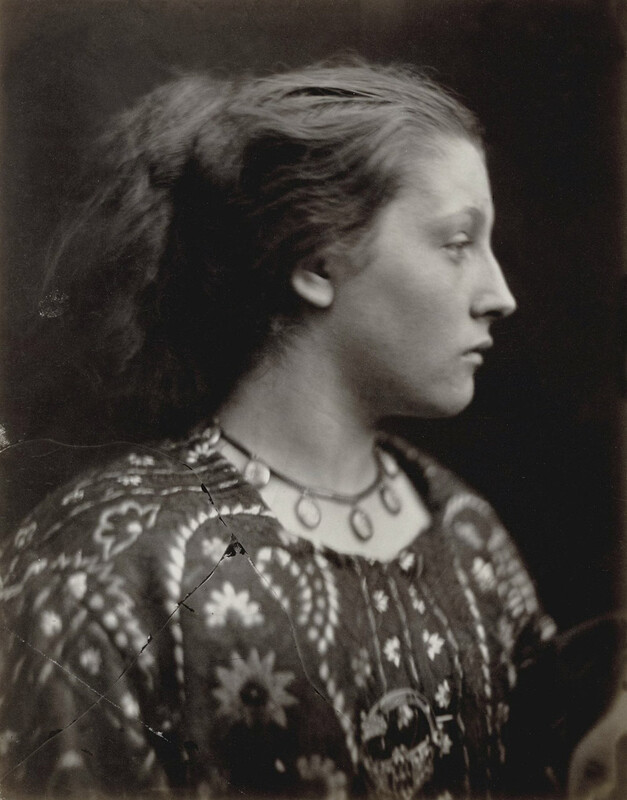 Ultimately – and predictably – she was unhappy with the way her photographs looked reduced in scale and translated into wood engravings, and she chose to issue a deluxe edition, at her own risk, that included a dozen full size photographic prints in each of two volumes. 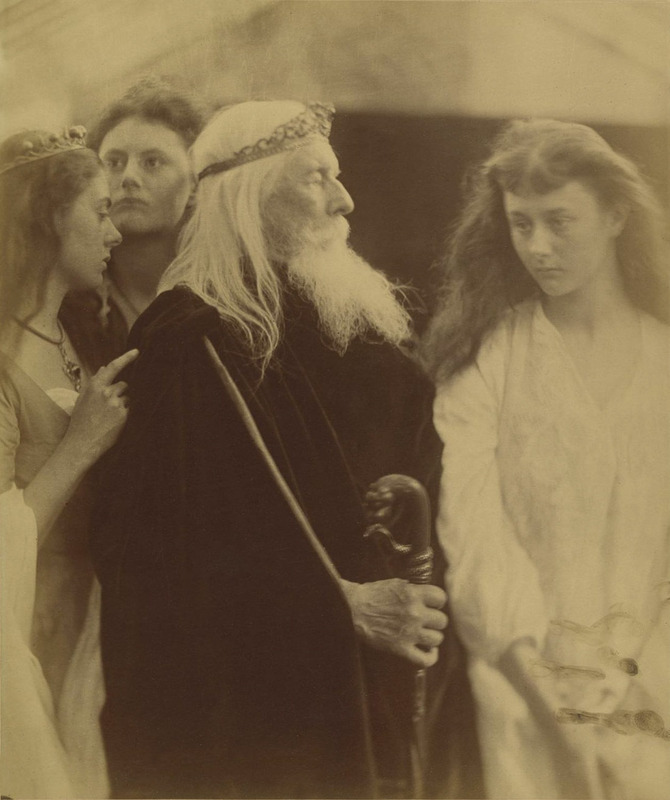 The three Liddell sisters – Lorina, Elizabeth, and Alice – posed with the photographer’s husband playing the tragically deceived King Lear in one of Cameron’s few Shakespearean compositions. Goneril and Regan whisper false flattery in the aging king’s ear while the truly devoted but disinherited Cordelia – here unadorned and dressed in white – stands before him, an embodiment of disillusioned innocence.